What would you say if I told you Boston has bad traffic? You'd probably punch me in the face and say "duh" - and I'd probably deserve it. But a company called Inrix has compiled some of the traffic data and statistics and it's actually pretty interesting to read. I agree with the top 4 for sure. Dallas, I find a little hard to believe. I lived there for 18 years, Dallas traffic is nothing compared to Boston. But I guess that's just my opinion/experience. Or maybe it's gotten worse since I left. Anyhoo. Click (here) to see the various scorecards for the cities. PS. Avoid, northbound on the Southeast Expy at MORRISSEY BLVD/NEPONSET AVE. It's supposedly the worst bottleneck in the city. 5 Response to "Boston Traffic Statistics"
I think we're not higher up on the list as it seems they were not including important arteries like sturrow drive and rt 9.
it's not just how bad the actual traffic is. it's also how crappy boston drivers are versus all the other cities, which makes driving in boston so aggravating. While Boston does have some bad traffic and some of the worst drivers in the country, if you look at this in perspective Boston not that bad compared to other cities in the list. 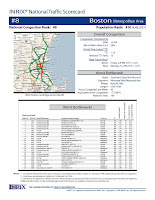 None of the 100 worst bottlenecks they list are in Boston. Seems about right to me, at least the top two. I often say to my wife, when we are dealing with typical Boston-area traffic, "At least we're not in L.A. or New York." San Francisco and Washington can have their moments, too. Last week, I was in London and then about 3 hours west of London, in South Devon. London's pretty busy, but as I was in a car only once (short taxi ride), can't really compare it. South Devon: What they lack in traffic density, they make up for in stunningly narrow roads with high hedges on each side. All of these are two-way. Good thing friends did all the driving! I'd rather be on on rush hour 1128 anytime!